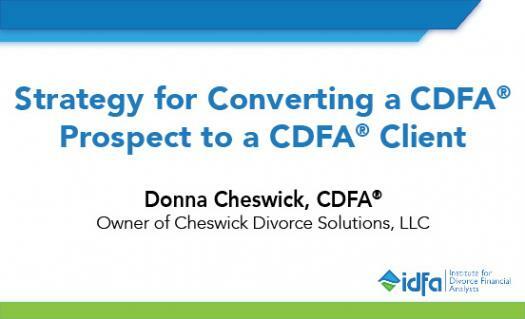 IDFA's August webinar discusses ideas and strategies designed to streamline your initial contact with a prospective CDFA® client to spur them into taking action. Watch the webinar on the IDFA website. Please complete the following quiz for one hour of CE credit for your CDFA designation. This quiz will be available until November 30, 2018. If you pass the quiz, you will receive a certificate to submit in your IDFA account when reporting the CE credit. Users have two attempts to pass the quiz. After two failed attempts, you will be locked out of the quiz. To unlock the quiz, please contact IDFA's customer service team to have the quiz reset within one business day. Users will be given one additional attempt after the quiz is unlocked.